Oops - we don't appear to have a video for the DR-2010C. Very pleased, the scanner installed easily and quickly and functions as described. Now working through my pile of documents for scanning! My dealings with your company were also excellent. Thanks! The scanner is great. Tremendous quality and size wise is ultra compact. Automatically works out whether the paper is one or double sided and the software is user griendly A very good addition to my home office. 5/5. I can speak for the whole team here in our little office, but we LOVE the scanner! It was recommended to me by a friend and it has transformed our lives. We often have to scan 25-40 page documents which are double sided and this does it quickly, rarely a jam or missed page, even with different sizes of paper being fed into it... seems that right now if it isn't pinned down, we'll scan it! The accompanying PaperPort software is a dream. So very easy to use. Suffice to say, we highly recommend it. A great little scanner. Very compact when closed, then opens up to hold the paper. Both build quality and scan quality are excellent. It's slightly noisier than the DR-2050C, as it emits a low whine as it feeds the paper through, but not loud enough to become irritating. We've had no problems with the paper handling. 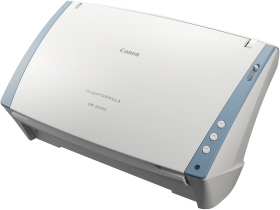 This is the 5th Canon scanner we have bought through Tradescanners and they are all still working well in daily use after 3 or 4 years. Quality items, and we don't even bother looking elsewhere when we need another scanner. I would just like to say that tradescanners.com were great to do business with your prompt reply to all my emails and also you made me aware of a good warranty which was very reasonable. The canon scanner in working great. Just to say that we have been using the Canon DR 2010C for the past 4 months and we are very pleased with the results. The speed of scanning is very impressive and the ability to scan both sides has speeded up our processing time considerably. I would recommend this machine to anyone who needs to scan lots of documents. Delivery was fast and easy buying experience will definately use again! The Scanner was extremely quick and easy to install. The duplex function worked with one pass through making this process a lot faster for our users. Introduce the DR-2010C into your business and you'll find a whole host of powerful functionality delivering high productivity scanning for groups of users or whole departments. And you'll find a device that makes the process simple, efficient and a trouble-free part of your working day. With a footprint measuring just 298 (w) x 160 (D) x 160 (H) the DR-2010C is one of the smallest and lightest scanners in its class. Perfect for placing on the corner of a desk or neatly on a small cabinet. Three programmable Job Buttons makes operation simple meaning tasks such as scan-to-email and scan-to-file can be effortlessly carried out without any additional software and just with the ?touch of a button?. For added convenience the scanner can be automatically switched ON/OFF, in-line with the PC.